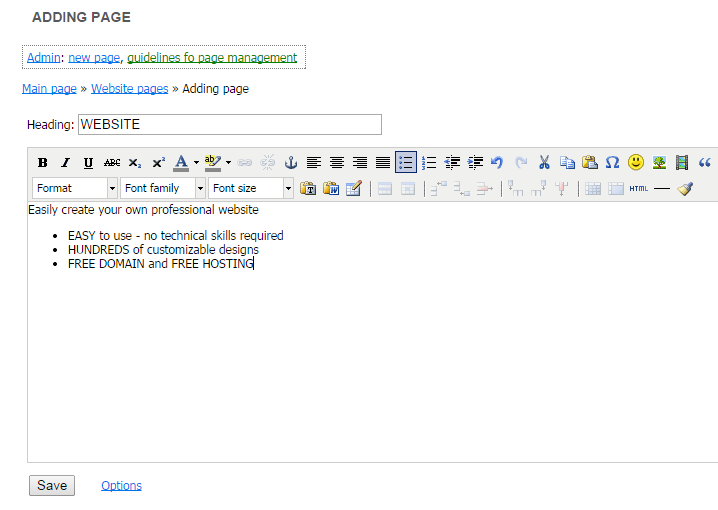 To create new pages in your website or edit the existing ones, in your website management system go to "Content" - "Website pages"
Use the active hyperlinks to view the list of all pages, to edit, delete, add page to the menu or create a new page. 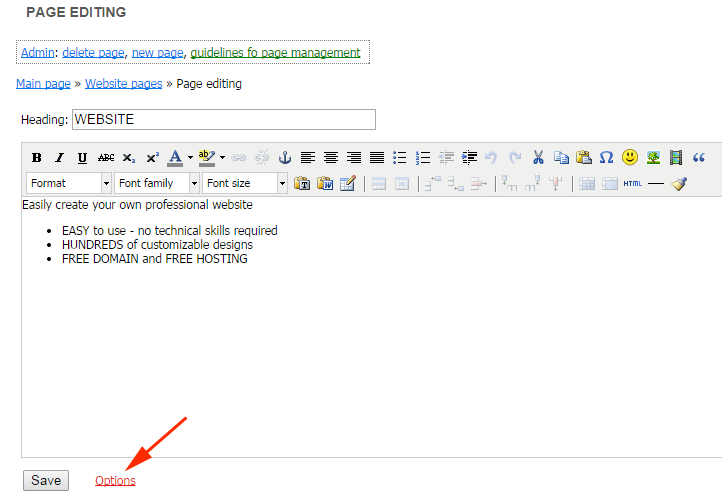 To change the page address, meta-tags or to add a password to a page, in the website management system go to "Content" - "Website pages", select the necessary page and click on "Edit". 1. File name. Important! Changing the page address (URL) causes the loss of the external links to the changed addresses, and it is necessary to change addresses in places or services in which they were used. 2. Title - this is the page name that shows in the browser top part. The "Title" tag content is often shown in the search results in search engines. 3. Meta-tag "Description" is devised for a short page description that is shown as an annotation to the page hyperlink in the search results. But nowadays this tag is mainly used by Google search engines (not in every case). More often the search engines just show a part of the page that contains results closest to the search as the annotation. 4. Page password. Usually page is password-protected to hide particular content that can be accessed only by a certain part of the audience. Page can be accessed only by users that know the password. For example, the pages can be accessible only to those users that are subscribed to the newsletter, training courses etc. Different website pages can have different passwords. Password-protected pages are not indexed by the search engines. To add a password to a page, write it in appropriate field: "Content" - "Website pages" - "Edit" - "Options" - "Page password". To remove a password from a page, open the page in the editing mode Content, - "Website pages" - "Edit" - "Options" - "Настройка" and remove the password from the "Page password" field. 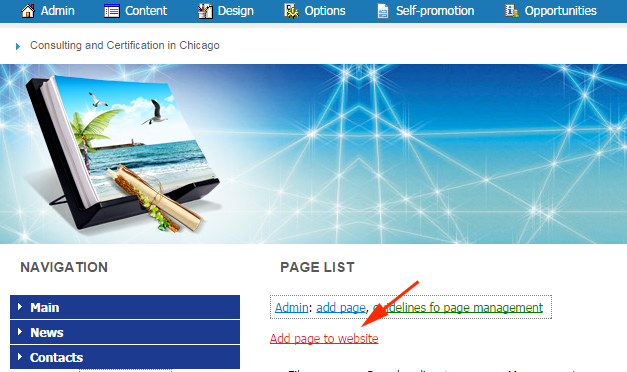 To delete a page go to the "Content" - "Website pages", and opposite of the corresponding page click on the "Delete"